Round 3-44: repeat round 2. The band measures 13 inches long, without stretching it. Fasten off and leave long tail for sewing. Finishing: sew together the ends and weave the tails. Fold the white band lengthwise and attach the red yarn in both loops. Step 2: do not join, work in continuous round. sc around, until the hat is 5 inches long, including the white band. Step 3: decreasing round, place a stitch marker *sc2tog, sc in the next 3 stitches* around the hat until you reach the stitch maker. Step 4: 3 rounds of sc around the hat. Next step: repeat step 3 & 4, until the top will close. You can make the tail long as you like. 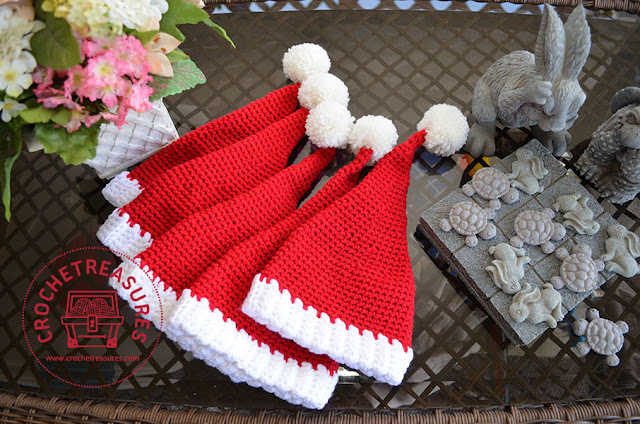 Make a pompom and sew at the tail of the hat. And weave all the ends.